This 12 gauge ammunition from Federal works great for hunting birds of both the clay and the feathered variety. Each 2-3/4" shell in this box of 25 fires a 1-1/8 oz. load of #8 shot at a muzzle velocity of 1,200 feet per second. This balanced configuration produces solid patterning and relatively low recoil. 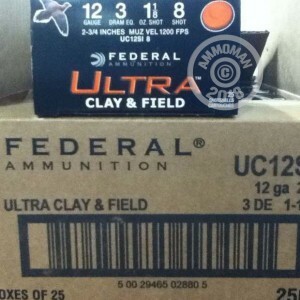 Federal shotshells are loaded in Anoka, Minnesota and deliver excellent performance at a reasonable cost. If you're planning on putting a lot of shot into the air, place a large order at AmmoMan.com--any order over $99 ships for free!